Gene editing is rapidly progressing from being a research/screening tool to one that promises important applications downstream in drug development and cell therapy. Cambridge Healthtech Institute’s inaugural symposium on New Frontiers in Gene Editing will bring together experts from all aspects of basic science and clinical research to talk about how and where gene editing can be best applied. What are the different tools that can be used for gene editing, and what are their strengths and limitations? How does the CRISPR (Clustered Regularly Interspaced Short Palindromic Repeats)/Cas system, compare to Transcription Activator-like Effector Nucleases (TALENs), zinc finger nucleases (ZFNs) and other systems and where are they being used? Scientists and clinicians from pharma/biotech as well as from academic and government labs will share their experiences leveraging the utility of gene editing for functional screening, creating cell lines and knock-outs for disease modeling, and for cell therapy. Chelsea Loughran, Associate, Litigation Group, Wolf, Greenfield and Sacks, P.C. The center was established in 2003 to promote an in-depth interdisciplinary basic and clinical research on the control of cellular and molecular processes that are involved in cancer initiation and progression. We strongly believe that the understanding of basic biological processes that underlie normal development and their deregulation in cancer, is crucial for our ability to identify molecular targets for early detection, intervention, and cure of the disease. We are interested in a broad view of cancer – from the single malignantly transformed cell and its microenvironment, through the entire tumor in the animal. We focus on targeted ubiquitin-mediated degradation of key regulatory proteins that are involved in malignant transformation [Prof. Aaron Ciechanover (Nobel Prize in Chemistry 2004)], angiogenesis and cancer progression (Prof. Gera Neufeld), metastasis and tumor microenvironment (Prof. Israel Vlodavsky), as well as genetic and genomic dissection of embryonic and cancer transcriptional networks (Dr. Amir Orian). Towards these objectives, we combine molecular, biochemical, cell biological with Drosophila genetic and genomics experimental approaches, as well as employing advanced models of angiogenesis and metastasis. We believe that scientific excellence and collegiality go together. Therefore, the center has an open and friendly atmosphere, creating a highly stimulating environment. The center is located in the 11th Floor of the Rappaport Faculty of Medicine building. It currently trains 45 graduate students, post-doctoral fellows, clinicians and researchers that are at the heart of our research. Formal and informal collaborations between individuals and laboratories are on-going and encouraged. We are running a series of joint seminars to which we invite researchers from Israel and abroad. The Center has advanced state-of-the-art microscopic and image analysis equipment, as well as other shared pieces of infrastructural equipment . The center is an integral part of the Faculty of Medicine and the Rappaport Research Institute which are home for excellent research groups, and enjoys their advanced Interdepartmental Equipment Unit. It is also adjacent to the Rambam Medical Center – the major hospital in the north of Israel – which provides us with access to rich clinical material and collaboration with clinicians. Many of them spend active research periods in our laboratories and bring the bench closer to the patient bed and vice versa. The Center is in an active phase of growth, and offers excellent research opportunities, space and facilities for students, post-doctoral fellows, and physicians. The cancer and vascular biology research center was established in 2003 to promote an in-depth interdisciplinary basic and clinical research on the control of cellular and molecular processes that are involved in cancer development and progression. Our goal is to advance knowledge in fundamental biological questions that are highly relevant for cancer. Personalized medicine holds promise of better cures with fewer side effects for many diseases. Individualized cancer therapy is sometimes utilized after multiple attempts of standard therapies and is based on several considerations, such as tumor type, acquired resistance to a specific therapy, previous treatment protocols, and other tumor-related factors. We have recently demonstrated that many cancer therapies can induce pro-tumorigenic or metastatic effects that derive not only from the tumor cells themselves, but also from host cells within the tumor microenvironment. The focus of research in my laboratory is to identify, characterize, and seek ways to block such pro-tumorigenic host effects observed after anti-cancer therapy, and thus potentially improve the outcome of current cancer therapies. Our findings may foster a paradigm shift in cancer therapy by minimizing the gap between preclinical findings and the clinical setting, laying the foundation for development of entirely new strategies for improving cancer therapy. 1Surgery Branch, National Cancer Institute (NCI), National Institutes of Health, Bethesda, MD 20892, USA. ↵* Department of Surgery, Université de Montréal, and Institut du Cancer de Montréal, Centre de Recherche du Centre Hospitalier de l’Université de Montréal, Montréal, QC H2X0A9, Canada. ↵† Present address: Cell and Gene Therapies, Novartis Institutes for BioMedical Research Incorporated, Cambridge, MA 02139, USA. Limited evidence exists that humans mount a mutation-specific T cell response to epithelial cancers. We used a whole-exomic-sequencing-based approach to demonstrate that tumor-infiltrating lymphocytes (TIL) from a patient with metastatic cholangiocarcinoma contained CD4+ T helper 1 (TH1) cells recognizing a mutation in erbb2 interacting protein (ERBB2IP) expressed by the cancer. After adoptive transfer of TIL containing about 25% mutation-specific polyfunctional TH1 cells, the patient achieved a decrease in target lesions with prolonged stabilization of disease. Upon disease progression, the patient was retreated with a >95% pure population of mutation-reactive TH1 cells and again experienced tumor regression. These results provide evidence that a CD4+ T cell response against a mutated antigen can be harnessed to mediate regression of a metastatic epithelial cancer. A new method for using immunotherapy to specifically attack tumor cells that have mutations unique to a patient’s cancer has been developed by scientists at the National Cancer Institute (NCI), part of the National Institutes of Health. The researchers demonstrated that the human immune system can mount a response against mutant proteins expressed by cancers that arise in epithelial cells which can line the internal and external surfaces (such as the skin) of the body. These cells give rise to many types of common cancers, such as those that develop in the digestive tract, lung, pancreas, bladder and other areas of the body. In ACT, a patient’s own TILs are collected, and those with the best antitumor activity are grown in the laboratory to produce large populations that are infused into the patient. 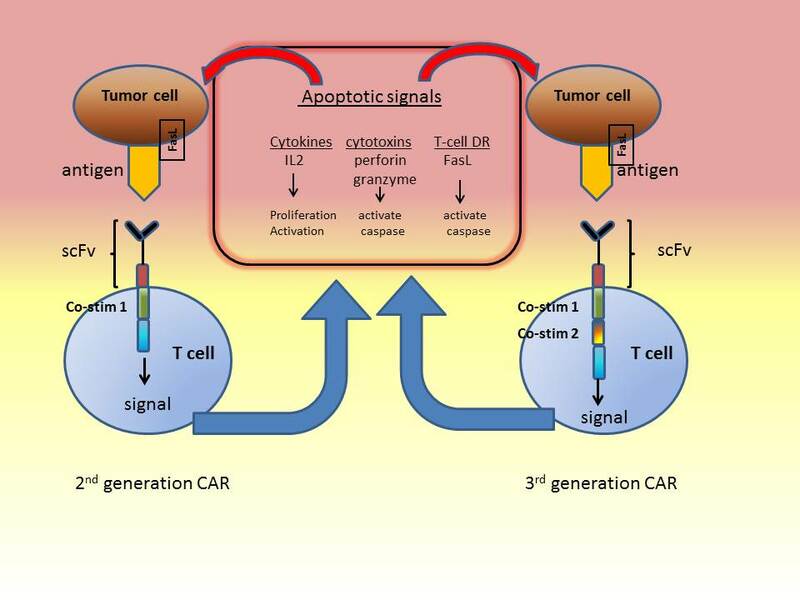 However, prior to this work it had not been clear whether the human immune system could mount an effective response against mutant proteins produced by epithelial cell cancers. These cells comprise more than 80 percent of all cancers. It was also not known whether such a response could be used to develop personalized immunotherapies for these cancers. The researchers first did whole-exome sequencing, in which the protein-coding regions of DNA are analyzed to identify mutations that the patient’s immune cells might recognize. Further testing showed that some of the patient’s TILs recognized a mutation in a protein called ERBB2-interacting protein (ERBB2IP). The patient then underwent adoptive cell transfer of 42.4 billion TILs, approximately 25 percent of which were ERBB2IP mutation-reactive T lymphocytes, which are primarily responsible for activating other cells to aid cellular immunity, followed by treatment with four doses of the anticancer drug interleukin-2 to enhance T-cell proliferation and function. Following transfer of the TILs, the patient’s metastatic lung and liver tumors stabilized. When the patient’s disease eventually progressed, after about 13 months, she was re-treated with ACT in which 95 percent of the transferred cells were mutation-reactive T cells, and she experienced tumor regression that was ongoing as of the last follow up (six months after the second T-cell infusion). These results provide evidence that a T-cell response against a mutant protein can be harnessed to mediate regression of a metastatic epithelial cell cancer. The National Cancer Institute (NCI) leads the National Cancer Program and the NIH effort to dramatically reduce the prevalence of cancer and improve the lives of cancer patients and their families, through research into prevention and cancer biology, the development of new interventions, and the training and mentoring of new researchers. For more information about cancer, please visit the NCI Web site at http://www.cancer.gov or call NCI’s Cancer Information Service at 1-800-4-CANCER (1-800-422-6237).